Why I loved Steve Jobs! Imagine this: Its Monday morning in the official headquarters and I’m in the ‘war room’, surrounded by uber-tech computer screens, sitting around a large wood-panelled table. My entire body finds solace in a soft, black leather swivel chair and I sink in, armed for another work week. Chit and chatter fill the air, colleagues at a meeting – planning, sharing and strategizing. Suddenly, my mouth is light and full of memories. Memories of my mom’s Ogbono soup, steaming with chunks of Norwegian stockfish and beef – unbelievable but true! I imagine a bowl of the gelatinous, orange-brown ‘stew’, flecked with bits of dried red chilli, thickened by the finely ground seeds of a native mango fruit. For in Nigeria, we have ‘eating soups’ (vs. drinking ones) which are, by strict definition stews. I feel the sun beat down my back as I lift and dip morsel after morsel of pounded yam (a thick paste of boiled yams, similar to mashed potatoes) into the perfectly salted soup. In a flash, the vision is gone and I am back to ‘earth’, mouth dry and left longing for a taste of home. The thought stays all day, through a typical cold Dutch ‘sandwich’ lunch – a soft white roll and a beef croquette (bread-crumbed roll of mashed potatoes and beef, deep-fried). Yum. Food, though that would be ‘strange’ in any Nigerian lunchbox, oft filled with rice and chicken, fried plantain (dodo) and a myriad of other warm meals. When the day is over, I head home from work with parched throat and a strong desire for home food. Next to me on the bus sits an Iranian friend. We begin talking and I narrate my ‘soup’ dream from earlier on. His comment ‘Maybe it is time to go home’ lodges a wedge deep inside my heart. And quells the panic that grips me when I think about moving back home, to Nigeria. I arrive home and am thrilled to see my husband has prepared a Nigerian meal for dinner – not the soup I dreamt about but good enough to ease the pain inside. As we sit to eat at our stone table, looking out the wide windows in our open kitchen, I am shocked at how quickly 4 years here have gone by. 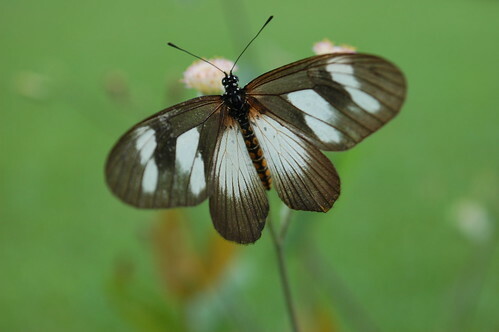 We’re back, closer to the warmth, sunshine and rain, resident on the equator and only 52 months after our departure. The constant hum of life is interesting and an octave louder than perhaps we are used to. Blaring horns, sirens (and not only those of ambulances) and other urban sounds dot the scale. 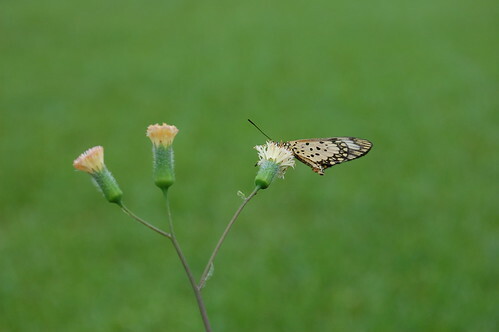 The formerly familiar landscape now holds both delight and surprise for me – gorgeous patterned butterflies and tree squirrels only a smattering of them. There is so much green. Not the green of perfectly manicured lawns in parks and pruned trees but that of vibrant and thriving savannas thick with health and tropical grassland. The trees stand tall and high, surrounded by thickets of grass beneath. One might proclaim this evidence of good living and thank the rain gods who send waters from on high with amazing regularity. Me? I’m fine, embracing the closed kitchens everywhere – at my sister’s house and now in our transit bungalow. It is wonderful to shut off scents of (pungent) cooking and not worry about smoke-filled living rooms. Unlike in my open Dutch kitchen where sweet and sour fragrances, piling dishes in the sink and bread-crumbed work tops were in full glare of guests and neighbours. The first soup I make on our return is Ogbono, a soup thickened with the ground seeds of the same name – inner kernels of a variety of African wild mango. The soup is not like my mother’s, but it is good enough for my children to gobble it up. Its toffee hues might not endear it to those who haven’t yet acquired an eye for the African food palette; and its mucilaginous properties (similar to okro) might distance it from many but it is one worthy of a homecoming. Yet it is this very ‘gelatinous’ quality hated across the globe, that is the very reason for which it is prized in Nigeria. It is this very characteristic that makes it an easy soup to ‘eat’. 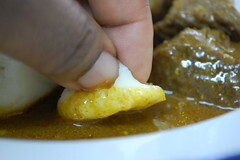 In fact, Ogbono soup is one of the first soups toddlers transition to when they leave the world of cereal – it is full of good fats and it allows balls of starch (be it from plantain, yam or cassava flour) to be slinked down young throats with minimal fuss. Ogbono seed is composed of about 45% Lauric acid (which helps ‘good’ cholestrol), and 46% Myristic acid. The best taste description is ‘earthy’ – not of sand and clay but complex and nutty, with a lacing of sweetness and a faint nutmeg fragrance. Some say it tastes like walnuts with an unidentified aftertaste. And that’s when I discover that Ogbono is being marketed as a supplement with some people attesting to its help in weight loss. Oh my word, this may just be the reason I came home – to eat Ogbono and grow slim!:-). Apparently, due to its composition ‘Ogbono reverses “leptin resistance” caused by the binding of C-reactive protein (CRP) to leptin. That is, the Ogbono works it magic by cleaving the bond between CRP and leptin, thereby allowing leptin to cross blood-brain barrier to give us the “full” signal, and allowing leptin to pass through cell walls giving the instruction to burn fat’. My goal is simple and does not involve getting thin – make a soup that my offspring will enjoy with their pounded yam, a ‘paste’ cooked like the Italians do their polenta – in water and over heat, till a transformation occurs from flour mixture to hot dough. 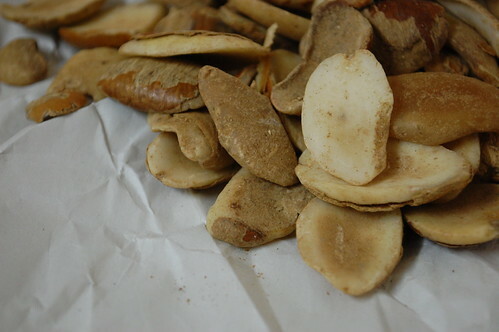 In this case, the input is dehydrated yam flour, milled to superfine consistency and easy to prepare. The result is warm, pillowy edible dough that makes itself spoon and scoop for the soup. And I am reminded of the bread and flour dumplings that are essential to Czech cuisine and which we sampled in the February freeze that was Prague. These are similar but lighter. How interesting to keep finding common ground in the world’s cuisines. 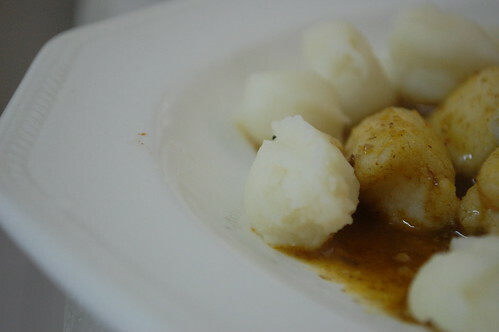 Typically, the pounded yam is portioned in hand-formed small balls or spooned ovals for tiny hands, in shapes reminiscent of gnocchi. The balls may be tossed in some soup and devoured with a fork, or with fingertips. 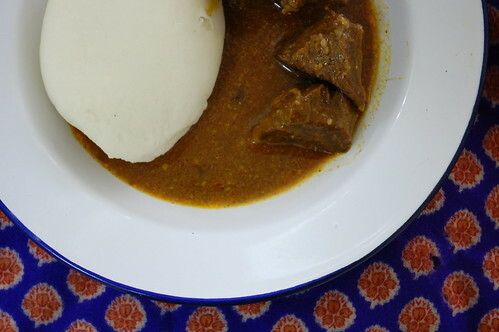 Sometimes, the eater is finnicky and the soup is served in a separate bowl, with the pounded yam in another. 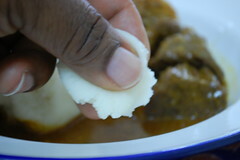 When age is no longer a concern, the recipient receives a mound of pounded yam (not small balls), sometimes fashioned into a smooth ball or oval and he or she pulls of bits, ripe for soup-dipping. Adults too can be finnicky and may request their soups come in bowls. That is often an easy one to fulfill. 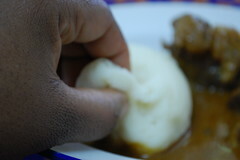 Sometimes, the pounded yam is ‘chewed’, before it heads down throats. This is largely the preserve of children. Grown men and women ‘swallow’ the balls. They don’t chew. Needless to say that this is far from a traditional ‘summer’ light lunch or dinner. In Nigeria though, meals know no seasons. Some produce may be seasonal but the same dishes are cooked all year round. Uses/products: Soups thickeners; Thick cakes called dike bread or Gabon chocolate….and a new discovery for me – as a fat-burning supplement! Taste profile: Nutty and earthy, with a hint of sweetness. Once you add the ogbono to the pot, do not put the lid back on as this will retard thickening and ‘drawability’! In a large pot, combine the meat, water, chopped onion, crayfish, salt and chili powder. Bring to the boil on medium heat and once boiling, reduce heat to a simmer in a covered pot till the meat is almost cooked. 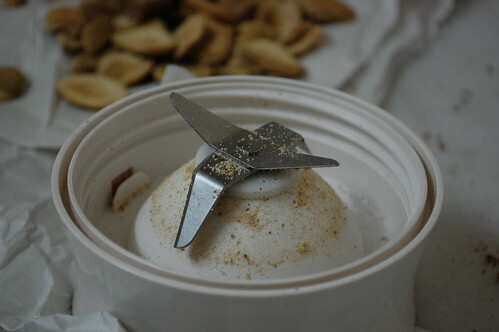 Check and adjust seasoning as desired. 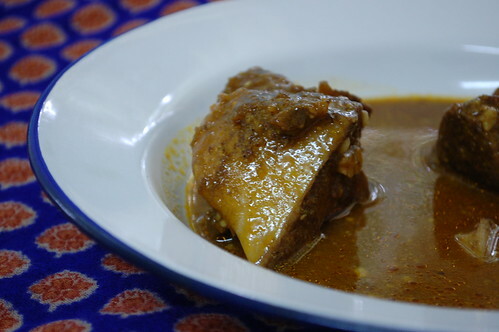 In a small bowl, combine the palm oil and ogbono powder, till oil is absorbed and the powder turns reddy-orange. Remove lid from the pot and add the oil-ogbono mixture to the soup and meat by the tablespoonful, stirring to ensure it is well mixed. Allow to simmer/boil for 3-4 minutes and check consistency. To thicken, add more and adjust till desired texture is achieved. If it is too thick, thin by adding some water. Note, you will need to check the seasoning and adjust if necessary. Serve with Pounded yam. Some people have been known to eat it with white rice. I am not one of them. Desperate to try this? 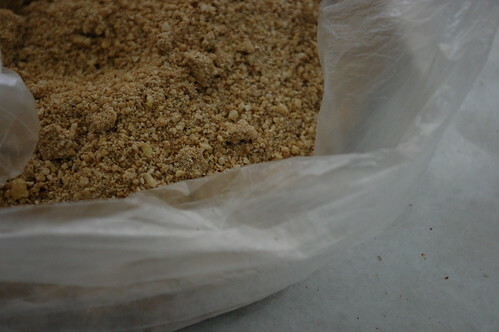 Packaged ogbono (whole or crushed) is often available in ‘African shops’. Coming next? ‘My Favourite Things’ – the Nostalgic 80’s! Typically, I publish ‘My Favourite Things’ at the start of every month but the last few months have been far from typical for me. This is my apology.